Mutfak, restaurant ve otel gibi ortamlar için başta davlumbaz söndürme sistemleri olmak üzere, tüm mekanın yangın güvenliği için alternatif çözümler sunuyoruz. The modern commercial kitchens serve up a host of fire hazards due to accumulation of flammable grease on kitchen equipments and high temperature in environment. Ventilating systems deposit grease from cooking vapors throughout the hood, filters, and ducts. Electric power and gas services increase the risk of fire and, thus, should be switched off before beginning fire. Akronex’s fire extinguishing system inside hood protects all different areas of risk and provides all additional functions. AKRONEX PRESENTS A COMPLETE AUTOMATIC FIRE EXTINGUISHING SYSTEMS AND FIRE SAFETY, CONSISTING OF FOLLOWINGS AT ECONOMICAL PRICES. Automatic detection and activation management provides 24 hours protection. In addition of fire detection, you can activate the system manually thanks to a special system of manual activation. The most effective agent in fire extinguishing industry. Thanks to high pH formula it extinguishes fire and prevents reignition. Steel cylinders under pressure are always ready to discharge the fire extinguishing agent in case of fire. Pressure transducer on the cylinder of fire extinguishing agent provides visual control. 100 % installed and tested control block ensures safe operation of the input and output functions. Installation will be made without disturbing the workflow of your kitchen due to the flexible pipe configuration. Protective chrome cover protects nozzle from clogging by dirt and grease, providing discharge of gas without interruption. Nozzles’ cover are removing and don’t interrupt the discharge of fire extinguisher. Akronex’s fire extinguishing systems are available in various sizes to suit your needs. In system designing we take into account the possible changes and expansions of your kitchen. Design, installation and maintenance of Akronex’s system into hood are carried out by our trained and certified technicians. Akronex’s liquid agent is designed to use in fire fighting systems into hoods and K class extinguishers. This liquid agent is effective against fire caused by oils that accumulate onto kitchen equipments and ventilation systems. Do not use at fires arising from the electrical circuits. Akronex’s liquid is a specially designed chemical inorganic salt solution. The agent is pre-mixed, therefore eliminating necessity of distillation before system’s filling. When used as fire extinguisher the agent doesn’t reveal any toxic substances. WARNING: Be careful when using the agent. In case of contact with eyes or skin should be rinsed with water within 15 minutes. In case of absorption of agent, drink milk or water and immediately seek medical advice. Application of Akronex’s wet agent with Akronex’s fire suppression systems inside hood or Akronex’s extinguishers is more effective in fire fighting into ventilation systems (exhaust, chimney, etc.) and stoves (deep fryers, cookers, wok, grill etc.) Acceptable environmental temperature is 49oC. The fire extinguisher reaches the burning surface of kitchen equipment, cooling them and reacts with hot fat (saponification reaction), forming a soap suds layer on the fat’s surface. This layer performs the function of insulation between the hot fatty film and atmosphere, preventing the release of flammable vapors and oxygen supply, thereby eliminating the risk of reigniting. For refill services you can contact to authorized distributors of Akronex. 1.1 1.1 This specification presents the technical characteristics of fire fighting systems consisting of detection and automatic extinguishing of a possible fire on kitchen equipments with high fire risk: chimney, hoods, filters, stoves, ovens, grills and other similar items for cooking. 2.1 2.1 This specification includes a wet chemical agent, applied for kitchen hood systems; storage cylinders of fire extinguishers, fire detection and mechanical discharge units, discharge nozzles and other developed materials of auxiliary equipments; and installation manual. 3.1 Each system integrally with each other makes a single unit, and all items will be product of the same manufacturer. 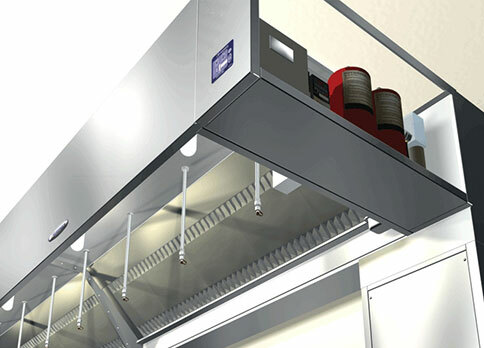 3.2 Design of hood systems, scale drawing of kitchen layout is based on the norms of NFPA (96 and 17A) and UL300 standards. 3.3 The system is activated by detectors inside hood or by manual activation button, installed on the evacuation routes, and extinguishes the fire discharging the wet chemical extinguishing agent that does not harm the environment where were discharged. 3.4 All units used in the system approved by UL300. The company will specify this fact in the quotation. 3.5 For each group of devices and hoods, which are the subject of risk will be applied a single system. 4.1.1 System design is carried out, by the scale drawings of kitchen layout provided by administrator or by results of Contractor’s calculation after studying of kitchen layout, according to norms of NFPA (96 or 17A) and UL300. 4.1.2 The company will provide administrator with draft decisions, main criteria for designing, method of payment in quotation, referring to the relevant items of the relevant standards, together with scale drawings. 4.2.2 Storage cylinder of wet chemical fire extinguishing agent: cylinders should be made of stainless steel. According to working pressure 20оС DE 175 PSL, it pressurized by dry nitrogen. Operating status of cylinder can be controlled through the manometer. The valves on the cylinders shall be made of brass. Cylinders are red painted by RAL 3000. 4.2.3 Device of mechanical discharge: mechanical discharge device is a box made of stainless steel with a fixed cap on the front side, which pushes the moving gas into cylinder of fire extinguisher by spring, pneumatic and mechanical way. On the cover will be plate, indicating the device status (ready/active). Attached manual start contact, providing manual activation of system, operation of which is blocked under normal conditions by disk. 4.2.4 Nozzles: Every used type of nozzles will be tested and approved for application in special restaurant systems. Nozzles are made of brass of chrome finish. On the spraying part on chrome finish are labeled form and flow rate of spray. Supplied with filter preventing clogging of nozzle. In addition, there is a plastic cover opening during discharging. 4.2.5 Detection system: there is mounted detector with metal insurance (activates at 182oC), which detects the heat rising from fire inside hood or on the stove and metal insurance is disconnecting in result of melting. Detection wire made of solid steel material is mounted and taut between detector and mechanical discharge device. Principe of operation: Due to high temperature during the fire till 182oC DE detector with metal insurance is melted and disconnected, fire detection wire is weaken and thus mechanism of discharge is started. 4.2.6 The line of discharge: the discharge line is made of seamless stainless steel pipes. Galvanized pipe and galvanized fittings are strictly not used. Pipe joints are not flexible and on bends it is necessary to use fittings. Will be used teflon seal for hermeticity. Out surface of the joints and pipes will be cleaned from dirt, grease and rust. Pipes are mounted in such way that can withstand to vibration and impacts. 4.2.7 Manual start button: two wires sensitive against fire, one passing through a line from mechanism and the other through a separate line are connected to the device. When you press the button, these wires are stretched, thereby activating the mechanism. 4.2.8 Key contact: Key contact with one out will be used to send a signal into existing alarm system mounted inside discharge device, open and close the electric stoves and other devices running on electricity. 5.1 The Contractor holds one day personal training on the theory and application of fire suppression systems inside the kitchen hood. Amount of personnel will be determined by administrator. 5.2 The training can be prolonged if the administrator considers it necessary. 6.1 Contractor sends to Consumer the documents, consisting of the operating instructions and other data in 3 copies and catalogue in Turkish. 7.1 Fire suppression systems inside hood have a guarantee for at least 2 years against manufacturing and installation defects. The Company prepares all relevant documents and sends them to the consumer. 8.1 The company provides at least one certified technical staff in order to conduct any type of service as maintenance, repair, servicing of fire suppression systems inside kitchen hood, and the contractor will indicate it in the quotation. 8.2 The Contractor provides parts and maintenance for at least 10 years.